Passed peacefully away surrounded by his loving family on March 9, 2017 at the Health Sciences Complex, age 60 years. Left with treasured memories his son and light of his life Ryan and his mother Holly Stone, parents Hubert and Emma, siblings Christine Young (Charlie), David Harnett (Heather) and Michelle Maher (Larry), nieces and nephews Jeff (Sara), Jana, Caitlin and Melanie, great niece and nephew Joshua and Rachel, and many other relatives. Paul was also blessed with a large circle of close and devoted friends. Cremation has taken place and a celebration of Paul’s life will be held in Corner Brook on March 17, 2017 from 7-9:30 p.m. at Blomidon Country Club. Donations in his memory may be made to a charity of one’s choice. Funeral arrangements have been entrusted to Carnell’s Funeral Home Limited. I just heard of Paul’s passing. I met Paul many moons ago through our mutual friend Peter Bugden. During the mid-80’s I lived in Corner Brook for a bit and roomed with Paul. He was a good friend and played a major role in my enjoyment of Corner Brook. From there we both went our separate ways however my memories of the Horn are happy ones that bring smiles to my face. My sincere sympathies to his family and friends. know how I ‘m going to handle that. I offer you my sincerest sympathies. Geralyn and I are at a loss to find words that could help during this difficult time. Rest assured though that our many conversations with Paul, he always let us know how important each of you were to him. We, as well as many others will find it impossible to fill the hole that he has left in our lives since his passing. Paul was one of a kind and we loved him. I only heard of Paul’s passing yesterday . It tore a piece out of my heart. As junior golfers we played a lot and I truly admired him . He was always there at the provincial tournaments and his presence was seen among us all. I remember playing with him a lot in the big tournaments and he always praised me up when I hit a good shot. That meant a lot to me and helped with my confidence in the game. Paul passing will leave a big hole in the golf in Newfoundland and Labrador . My condolences to family and friends. I will miss him a lot. Susan and I were deeply saddened by the loss of our dear friend Paul. He has been a loyal and generous friend to us for many, many years. We will cherish the memories of the times spent together. Please know we will remember Paul for his strength of character, his sense of fairness and generosity and his love of his family. We were very sorry to receive the news of Paul’s passing…. We cannot imagine how difficult this time must be for you, and are thankful you are surrounded by the loving support of your kind family and friends. We hope many treasured memories of Paul will bring you comfort in the time ahead. We were so sorry to hear of Paul’s passing. Treasure every memory in your hearts. Our thought and prayers are with you all. Ryan, you’re one of my best friends, and I have nothing but fond memories of Mr. Harnett. The boys and I are so saddened by this and have your family and you in our thoughts and prayers. Mr. Harnett’s greatness will shine through you, I have no doubt. So sorry for your loss. May loving memories help you through this time of sorrow. There is no doubt that Paul left a remarkable impact on all those he encountered whether it be at the Golf Course, Marble, work or in the community. Treasure all the memories you have of your time together and always remember the strength of his love for all of you, especially Ryan his pride and joy. Paul’s love for life will live on through each of you. To Chris and Dave, I am sorry to hear of Paul’s untimely passing. Please accept my condolences and take comfort in the memories that he left behind. Uncle Hubert and Aunt Emma, so sad to hear of Paul’s passing. Our hearts go out to you and all of the family during this time. You are in our thoughts and prayers. Paul we are wishing you God’s speed! To Hubert, Emma, and all Paul’s family and many friends I send my sincere sympathy on the loss of Paul. May he rest in peace. We were so sorry to learn of your loss of your son Paul. Please accept our deepest condolences. May God be with both in your loss. So sorry to hear of Paul’s passing. He was a warm and wonderful human being. When I was in Corner Brook last year I saw him at the car dealership and we talked about everything under the sun for about an hour. I’ll always be grateful for that conversation. Much Love, light & peace to the Harnett family. To the Harnett family. Paul was my first friend when we moved to Corner Brook in 1964 when we were backyard neighbours. In Lower Townsite. While we didn’t’ see a lot of each other in recent years I still cherish the memories of Horn and his siblings and parents. I went through the tributes on line and smiled as I saw a lot of our childhood friends contribute their memories. They say it all. Deepest condolences to Ryan and your entire family. Our thoughts and prayers are with you all at this difficult time. I was deeply saddened by Paul’s passing, and only hope it helps to know that my thoughts, and those of so many people are with you at this difficult time. Although I think of Paul as a friend, I guess I knew him best through my brother Peter. Certainly I would have been sent out on occasion by our Mom to track them down, either for fear of harm or out of the way behaviour on their part. It always made for some good laughs later on in years. I always enjoyed catching up with Paul at Blomidon or Marble when I was in town. He was a larger than life type guy and will be thought of often. My thoughts and prayers are with you now. My deepest condolences to Paul’s family. Our families have been life long friends. I’m so very sorry. Our deepest condolences to Dave,Heather and all the family at this sad time.Our prayers and thoughts are with you all. Our deepest condolences to Dave,Heather and all the family at this sad time.Our thoughts and prayers are with you all. by John and Lorraine Quinlan. Our deepest condolences to Ryan and your family. You were in our thoughts so often this past weekend Ryan. The team wanted to win for you. May all the memories you have help you through this difficult time. Our thoughts and prayers are with you all. Ryan and Holly we are sorry to hear of Paul’s passing, and the loss it is to both of you. Our thoughts and prayers are with you. So sorry to hear of Paul’s passing. We had so much fun growing up together, and our years with the progress club helping those less fortunate.. We wish Paul’s family our heart felt condolences and thank him for wonderful memories that will live in our hearts and minds all the days of our lives. It is hard to believe it was only a few short months ago that we were down at Paul’s in Florida on our annual golf trip having a merry old time and like oft times over recent years in particular, being regaled and entertained by the Big Horn. It was always worth the price of admission for Dave, Greg and myself! His passing is a direct and heavy hit for all of us who were in his circle of friends and loved ones. He will never be gone from our minds. Sincerest condolences to the Harnett family. God bless you all. My condolences to all. Saddened when I heard the news. How well I remember the great times skiing together and everything that goes with it. Wishing you deep powder and sun wherever you are. Very sad to here of Paul’s passing. I always enjoyed bumping into him at the ball field reminiscing and catching up on the whereabouts of family. My thoughts and prayers are with the Harnett family. Donna and I offer our sincere condolences to the Harnett family on the loss of our beloved cousin. Paul will be sadly missed and gladly remembered by all who had the pleasure of knowing him. I met Paul in 2004 when he strolled into my office a total stranger and 24 hours later we had a business deal done that for better or worse put Paul in the car business. Thoughtful and insightful guy with his pinky finger stuck in his mouth, I don’t think we ever had a conversation since that didn’t involve an update on Ryan and how proud Paul was of him. Renée and I are saddened to hear of Paul’s passing. Condolences to the entire family. We are very sorry for your loss. The only consolation we have is that Hubert Jr is gone to Heaven. God bless you always. Marion, John Marcinov & Family. Myself and the Big Horn always loved ribbing each other, especially about golf. From bunker play to driving the ball and all points in between. One thing you couldn’t take from him he could drive the ball with anyone! Hey did I really say that! !Lol I always enjoyed our many conversations over the years they were worth the cash!! God speed my brother!!! Our deepest condolences to Ryan and all of the Harnett family. We were saddened to hear the news of Paul’s passing. I had many conversations with Paul during our time with Honda regarding everything from the automotive business world, golf, friends and family and of course his son Ryan. Paul always had a smile and a story to share regardless of where we were. I will miss those chats. Rest in peace my friend. Michelle and family, our thoughts are with you at this difficult time. No words can fill the void of your loss, but the strength and comfort of family and friends will help ease the pain so lean on them. The world has lost yet another fine man, rest easy Paul. We are so sorry to learn of Paul’s passing, I have many fond memories of Paul during our Canadian Progress Club days. Our prayers and thoughts are with you and your Families at this most difficult time. Bob and Gertie Mercer. Corner Brook. Charlie and Chris, I was shocked to here of Pauls passing. Please know that Vonnie and I are thinking of you and the Harnett family during this difficult time. Keeping you all in our prayers. Barb and I are saddened to hear of Paul’s passing. My thoughts and prayers are with all the Harnett family at this most difficult time. Paul and I talked golf on many occasions over the years. I am presently out of the province but will be thinking of you all at the celebration of Paul’s life at the Blomidon Club. Chris, Charlie and family: so sorry to hear of your loss. Thinking of all you at this sad time. Linda and Edgar Dawe. Harnett family, Ryan and Holly, so saddened to hear of Paul’s passing, The Stone and Sheppard family offer our deepest condolences in this terrible time, To hear of Paul’s passing at such a young age was a great shock. anything we can do please call, Our prays go out to you. SO shocked to hear about the passing of Paul..always had a smile and a chat whenever we met .inCorner Brook., My sincere condolences…. Hugs and prayers! Chris and Charlie, we are so sorry to hear of Paul’s passing. Thinking of all of you at this difficult time. Hubert, Emma and family please accept our heart felt condolence on the passing of Paul. Unfortunately we are out of the country and can’t be there. Please know our thoughts and prayers are with the family during this difficult time. Knew Paul from my university days at MUN. My condolences to his family. troubled by things we do not understand. only lasting love and precious memories. We are thinking of you during this sad time. I was deeply saddened to hear of Paul’s passing. He was a pleasure to be around….always a story to tell or an issue to debate, and always with a smile and good humour. Please accept my heartfelt condolences. May the memories of happy times spent with Paul bring you comfort in the coming days. to all of the harnett family our deepest sympathy on the loss of your loved one such a young age our thoughts are with you at this difficult time. So sorry to hear of Paul’s passing . Our thoughts and prayers are with you at this most difficult time. So many fond memories of hanging out on Highland Ave. ,swim team, Blomiden Club. Heartfelt condolences to the Harnett family. Paul was taken from this life way too young. Surely he did enjoy life to the fullest, most likely when he was swinging a golf club or hanging out with his son.. His smile could light up a room. Rest in peace Paul. Your pain is over but those left behind will feel it forever. My thoughts and love are with the family today. Words are so difficult to come by when a loving family is grieving the loss of a beautiful person. Rest In Peace Paul. You will be missed. Our condolences to Hubert, Emma and all the family. My heartfelt condolences and sympathy to all of you. No words can express the devastation we are all feeling with the recent news of Paul’s passing. May warm thoughts and wonderful memories of Paul help you through your loss in the days ahead. Paul was quite simply my best friend. We maintained this close friendship for more than 50 years and shared many good times together. Memories of days spent on the golf course or having a drink and “debating” world events, are times I will cherish forever. I’ll miss you Horn. In the meantime, keep a spot on the tee sheet open for me; and I’ll see you someday on the other side. To the Harnett family. Sorry to hear of Pauls passing. Our prayers are with you during this difficult time. Always enjoyed seeing Paul by chance on my visits home. We would chat about our family and our kids. Will miss his wonderful smile and hugs. We are so saddened at the loss of our friend Paul. Our heartfelt condolences go out to Ryan and family. Our heartfelt condolences go out to the Harnett family. We are truly sorry for your loss. May the love of family and friends comfort you during these difficult days. Paul will be missed. Emma, Hubert and family, We were shocked and saddened to hear of Paul’s passing. Please know that you are all in our thoughts and prayers. Rest in peace Paul. Heartful condolences. Our thoughts and prayers are with you Hubert and Emma and family. Ryan, so sorry to hear about your dad. He was a great friend and sports trips to Corner Brook were hi-lited by getting together with your Dad for some grand chats and laughs. He will be missed dearly. So sorry & shocked by Paul’s sudden passing… Sympathy to you Holly & Ryan and also to the Harnett family. Prayers and thoughts are with you today. So sorry to hear of Paul’s passing. I’d see him many times on my business trips to Corner Brook some time ago. A fine person and always a pleasure to see. are with you at this difficult time of Paul’s passing! and now resting in peace. So saddened to hear of Paul’s passing. Sending along my condolences to the Harnett family. Lots of memories growing up in Corner Brook and enjoying university life in Bowater House. Thoughts and prayers are with you all. I am so very sorry to hear of Paul’s passing. I knew Paul through all the sporting events we took in together as our sons were both team mates and opponents over many years. He was a loving and devoted father who also gave so much of himself to the local sports community. To Ryan, Holly and the rest of his family my absolute deepest sympathy. Always a sweet guy. So sorry to hear of his passing. Emma, Hubert and the Harnett Family. Very sorry to hear of Paul’s passing. Thinking of you and may God give you strength in this difficult time. Sending my condolences to the Harnett family. I’m going to miss seeing Paul around the Blomidon Pro Shop this summer. He was always telling me jokes or pulling my leg about something. Rest in peace Paul. Hubert and Emma, my condolences you you on the passing of your son. May he rest in God’s peace. We are so very sorry to hear this very sad news. Our thoughts and prayers are with you at this extremely difficult time Ryan, you certainly were the light of his life. May the love and memories he left you with bring you comfort and strength. Paul was such a friendly and gentle soul. My condolences to the Harnett family and to his son Ryan whom he talked about with pride. 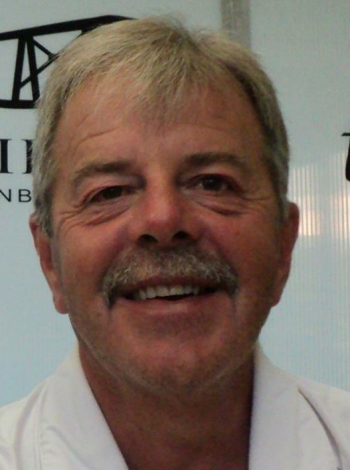 We will surely miss his conversations at Blomidon Golf Course, Rest In Peace Paul. My heartfelt sympathy to the family Prayers are with you. My condolences to the Harnett family. Paul and I, including a lot of names already offering condolences, went through St. Gerard’s and Regina/Presentation together. Once the family moved, it was a long walk up to Highland Avenue, but, I spent some time there as well. You are gone too young and will stay in my memories. My condolences to the Harnett Famiy and to his son Ryan….Gonna miss him at the Blomidon Golf Course..
Our deepest condolences to Ryan, Holly and the Harnett family . We will miss Paul’s smiling face and the stories he would share of Ryan’s accomplishments (with such pride ) . Treasure your memories. Our sincere condolences on the passing of your son Paul.Our thoughts are with you at this sad time. Freeman and Jean. I was saddened to hear of Paul’s passing. I knew him from Tara Golf & Country Club in Florida. He always had a smile for anyone. Godspeed my friend. Sending you sincere condolences upon the passing of Paul. May your many precious memories comfort you at this difficult time. Thinking of you and Ryan at this very difficult time. My sincere condolences to Ryan and the Harnett family! I spent many, many weekends traveling and watching our boys play basketball. Hard to believe. Rest in piece my friend. I am so heartbroken to hear of the passing of your Dad. He was such a friendly man, always smiling, and on each occasion that I saw him, he would speak of you with immense pride. I was always moved by his great love for you. Treasure your countless memories of this very special man, and know that he lives on in you. I am truly sorry for this deep loss. Many share in your sorrow. I was very saddened to learn of Paul’s passing. My heartfelt condolences to all of the Harnett family. I have so many memories of Paul as our neighbour, Especially his open, friendly nature. He was especially kind to our parents in their later years and would saunter over for a drink on the deck whenever any of my brothers or I were visiting. There were more than a few late nights talking about life , our kids, politics, etc. But most of all I will remember the laughter and Paul’s great smile. RIP my friend. Catch you on the other side. We are so saddened and alarmed at Paul’s passing. We spent the month of April on the same resort as Paul last year in Florida and got to know him even better than all the years growing up with him in Corner Brook. The smile he wore will be embedded in my head and my heart. Please accept sincere and deepest condolences. My deepest condolences to the Harnett family . Paul and I attended primary/elementary school together. Paul would hold my hand and walk to and from kindergarten with me when we both lived on Elswick Road. May your treasured memories of Paul warm your hearts at this difficult time. My thoughts and prayers are with you. I was saddened to hear of Paul’s passing. My heartfelt condolences to the entire Harnett family. May he rest in peace. My deepest sympathies to Ryan and all of Paul’s family. I know you will cherish the many fond memories as I will. My thoughts and prayers are with all of you. I am so sorry for your loss. I remember Paul as being larger than life, and as kids, one of the big brothers we looked up to. My condolences to you and all the family. My thoughts and prayers are with you. I am so saddened and truly sorry to hear of Pauls passing. Thoughts and prayers are with you all during this difficult time. I had the pleasure of meeting Paul When I moved to corner brook in 1990 and he quickly became one of my close friends..He was always so positive, knowledgeable and kind. Although we hadn’t seen each other a lot in the last number of years I have many many memoirs of “the horn”. God bless you my friend. May you rest in piece. So very sorry to hear of Paul’s passing. Whenever I saw him him he always had a smile on his face. He was a gentleman, a tribute to your parents. May he rest in peace and I hope that you find comfort in your memories. Take care of each other at this difficult time. My deepest and most sincerest condolences on Paul’s passing. We attended golf school together as kids and through the years growing up in Corner Brook had many laughs. He was an awesome pool player and would often fleece the boys over at Walts on Broadway. All in good fun. May the memories of Paul comfort you now do for all time. So sorry to hear of Paul’s passing. My condolences to family & friends. Fly on Angels wings my friend. Paul & I were elementary school friends. We reunited at the blomidon golf course in 2016. My most memorable moment with Paul was when he hit from the ditch on #6 and the ball landed on the green on 7. He was amazing. To the Harnett family my sincere condolences and my your memories of Paul provide you with comfort in he days ahead..
Our condolences to Paul’s family and close friends. Paul you will be forever missed by all my friend my condolences to the family and other friends we lost a great guy rest easy bud . So saddened by the news. My condolences to the Harnett family. I am shocked and saddened to hear of Paul’s passing. We enjoyed a chance game of golf with two other school chums from St Gerard’s days last summer and for that I am greatful. My condolences to all the family. RIP buddy. My condolences to the family. God speed, my friend, rest in peace. My heart is with you all.